Why don’t you strap the projector onto a baseball cap so you can turn your head around and look at things rather than turn your whole body to see around. I’m considering helmet mounting it. ﻿ The issue is decoupling the viewing from the aiming of the gun, so you don’t have to move your head to shoot an enemy. That’s something I can’t do without a serious overhaul of Cube, the first person shooter I hacked for this. It will take some time, but I may just write my own sandbox to play around with this stuff in, using a library like Panda3d or Ogre3d. Protip: duck hunt / nintendo light gun. You have a laser projector. It scans the image in lines. You can extrapolate where exactly the gun is pointed by mounting a light sensor behind a lens with a narrow field of view. When the software senses a trigger press, it flashes the screen white for one frame, and a timer counts how long it takes for the gun to see it. Wow if you could ever technically figure out a way to synchronize the game with a surround sound system this would be the ultimate virtual reality experience. I think it would be doable using OpenAL. It would be even easier using headphones with the projector head mounted. Pingback: La Gran N | Blog | Realidad Virtual con un Wiimote y un proyector láser. 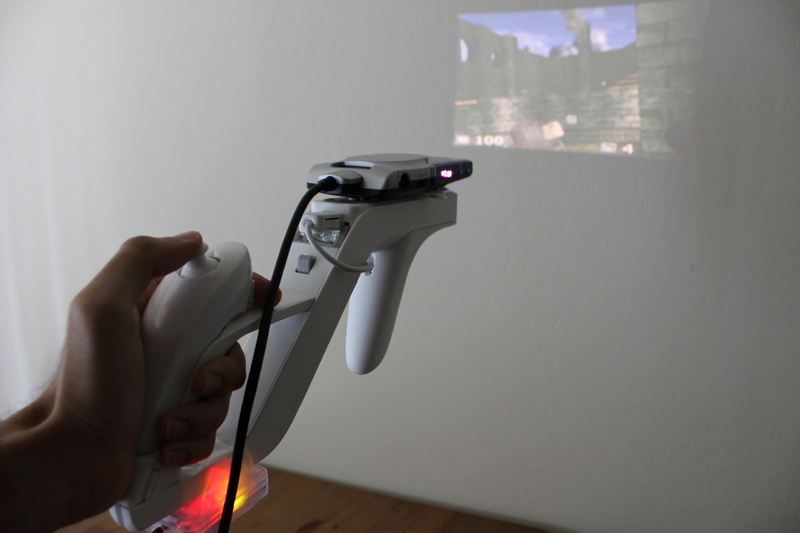 You know that you could literally create a 3D overlay of your house, modify it and then when you start your ‘game’ up you could move the gun around and it would project an ‘alternate side’ of your house with the projector. So you would have a 3D house overlapping your house, wherever you go in your house, it would match up. There is no Wii console involved. The Wii remote is connected to the laptop over bluetooth. Great projects Nirav! Have you considered using a head-mounted display (eg VR glasses)? Not sure on FOV of HMD vs. Showwx, but It might make it more of an immersive experience. Also, in your opinion, is the best point of input for a FPS the head or the gun? It’d be kind of weird aiming with your face, but you’d get a much more realistic mapping of turning your head to the movement on screen. I don’t think there are games (yet) where the gun is detached, although that’d be an even higher level of awesomeness. Yes. I thought about getting a Vuzix, but the FOV is really constricting. The FOV of the SHOWWX is marginally better, but still not great. At some point, I’m going to build my own HMD, but thats pretty low on the to do list. In my opinion, using your head for looking and a detached gun for pointing is by far the most immersive solution. I may revisit this project to add that. I believe it is often done for HMD based virtual reality. I’m glad Build 18 is still going strong. I took part in the first one at the end of the spring 09 semester. Unfortunately, we didn’t have a parts budget then, so we cobbled together an XBee/Arduino based wireless multimeter out of borrowed parts. Hmm…you might be able to get away with displaying a “farther out” view in front of you and just have turns not be as much angle-wise. Yes, separate would be ideal though. Awesome! Yes, having a cultivated budget from industry contacts is really nice and helps further “out there” ideas much faster. Not sure what I will do yet for spring’s Build 18, but I have a few ideas. I’ve just released a game (or proof of concept) on the Android Market where you use the sensors of the phone and a projector plugged into it to achieve the same results as without additional hardware. Quite simple at this stage but it’s cool! You can see a (crappy) video of the game at my site, or go download ‘Trapped!’ in the Android Market (I’d like to see it on a better projector, as mine is not very bright and led based, so post your videos if you get the chance!). Have you played any other games with this? Another FPS, like Counter-Strike perhaps?